Peter Comestor (i.e. Peter the Eater, a nickname given to him because of his voracious appetite for knowledge) wrote the 'Historia Scholastica' in Paris in about 1170. It is a continuous history, from Creation until the end of the Acts of the Apostles, based mainly on the narrative books of the Bible. This copy was written for the Benedictine nunnery of the Virgin Mary and St. Helen, Elstow (Bedfordshire). 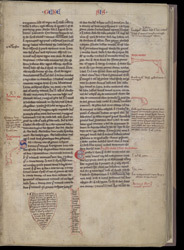 Medieval readers commonly marked passages of particular interest with a sketch of a pointing hand. On this page there is also a bird blowing a horn.